Davis Off Road Has Been Lifting Vehicles for Over 30 Years! The Davis’s have been lifting and customizing vehicles for themselves, friends, and clients since the late 1970’s. Demand for their skills soon grew – and what started as a personal hobby soon evolved to the successful business it is today. Davis Offroad was born in 1999 and the Davis’s began lifting trucks for the public. Since that time trucks have rolled in and out of their shop daily, where they have performed everything from simple leveling kits to full blown custom suspension lifts. 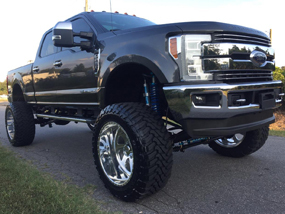 Davis Offroad has completed thousands of lifts over the years and knows what will work best for you and your truck. Whether you are looking to hit the trails, get to your favorite remote camping spot, or just make your truck stand out in the crowd - a suspension lift will give your truck the improved performance and wow-factor you are looking for. With companies like BDS Suspension, Zone OffRoad Products, Skyjacker Suspensions, Superlift Suspensions, Readylift Suspension Inc., Rough Country Suspension Systems, Procomp, and Fabtech offering kits starting at 4”s of lift (and only getting bigger from there!) we are sure to find the right setup for your needs. Can’t visualize your truck with a lift on it? Check-out our Previously Lifted Vehicles Page to see examples of setups that we can offer you. If you don’t see examples of what you’re looking for on our site - just ask! We would be more than happy to help you with a custom quote today.